By dpy, October 10, 2009 in Plugins - Publishing ONLY! Problem of Letter space is solved by v1.2 . I checked　that this work PDN v3.5.4 . It's OK. This is the plugin by barkbark00's　suggestion. 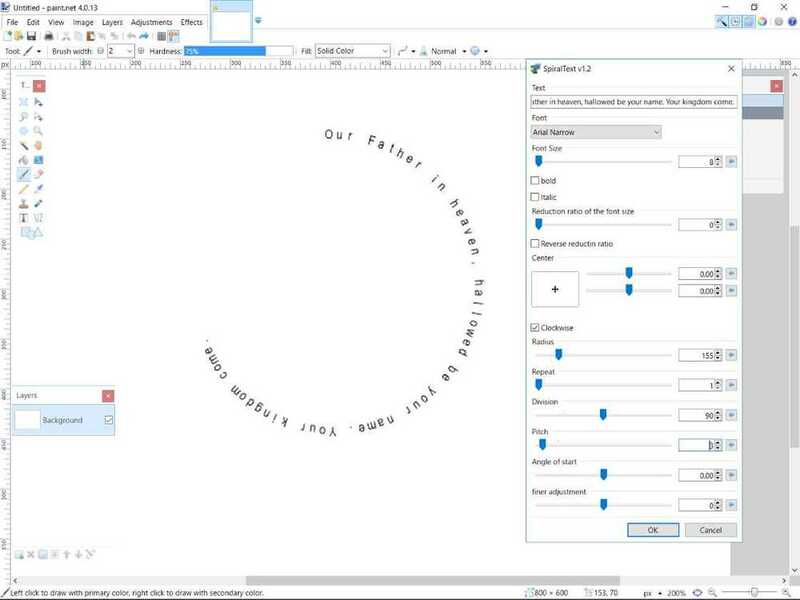 This plugin writes text on a spiral. I wish you use together other Text Fomations Family. If you choice it , pop-up window for error message opens . click "ok" , font changes "Arial". This is created by CodeLab. and This is base on EER's CodeLab sample "Font Names"
Thank you , BoltBait and Ego Eram Reputo. Added : Reverce redution ratio. Great job dpy! I love your plugin set. I did find one bug with SpiralText. It crashes when the radius is set to '0'. Full error message: PaintDotNet.WorkerThreadException: Worker thread threw an exception ---> System.ArgumentOutOfRangeException: Index and length must refer to a location within the string. thank you very much dspy. You should make a topic in the plugin place for all your plugins combined into one topic like simon brown and other plugin author's do. Circle text is working very well and I like it. You should make a topic in the plugin place for all your plugins combined into one topic like simon brown and other plugin author's do. I have the intention of my all plugin topic. maybe I will make it after released correct PDN v3.5 . I tested all my plugin only a few minutes on 3.5beta. maybe all no problem . but I can not say "perfect OK". When correct PDN version 3.5 and Codelab for PDN v3.5 are released officially , I will say "All my plugin is for PDN v3.5"
This is awesome dpy, I love all your plug ins. Edit: It even works with the beta version. May I suggest you to make two different downloads, as other creators ? I know quite a lot of people that can't understand the way your pack is made and the way to install the dll files. Anyway, your plugins are really great to use. I was waiting for a　suggestion　like you. but I didn't know how everyone was. But please wait next up date or new topic. maybe all my plugin is ok on PDN beta3. I tried succesfully the two others too (Spiral and Rotate) at the same time. I don't need repetition, I just need to coil a paragraph or more into a Spiral. The string limitation makes the tool very limited. I thought when I saw this it would be ideal but it was SO frustrating when I found this limitation. I want to use it to put a CD/DVD list of contents on the disk - created a script which CSVs file names which I would then want to import or copy & Paste to PDN for label.